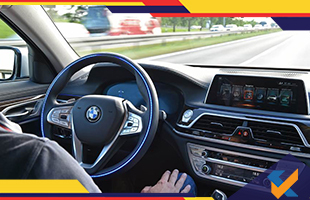 The Shanghai Intelligent Connected Autonomous Driving Test License issued by the Intelligent Connected Vehicle Road Test Promotion Team was received by BMW this year on May, 14. The Test Promotion Team consists of three institutions, namely - the Shanghai Municipal Commission of Economy and Informatization, the Shanghai Municipal Public Security Bureau and the Shanghai Municipal Transportation Commission. The good news that the license brings to BMW is that it can now test driverless cars in China. Bavaria Motor Works is officially the first international automobile manufacturing company to obtain this license in China. This is thus a big leap for autonomous driving in the world. The procurement of the license by BMW involves China playing a role in promoting Intelligent Connected Vehicles (ICVs) by boosting the prevalence of autonomous driving. This is all a part of ‘Smart city, Smart China’ initiative. Predicting such a development beforehand, BMW demonstrated L3 highly autonomous driving in the year 2016 on a highway in Chengdu under government supervision. BMW is now targeting Shanghai for its L4 autonomous driving demonstration and obtaining the license helps them do so. Under the obtained license, the R&D team will collect data based on actual China traffic covering its full complexity. This data will then be used for machine learning algorithms which are programmed with L4 autonomous driving behaviour. The test will be based on the latest BMW 7 series models, and the test sites of Shanghai presently 5.6km in length is yet to expand. Till date, the company has been able to acquire a mileage reach of 30,000km in terms of road testing and 200,000 km in case of computer simulations. Dr. Martin Sautter, the senior vice president of the R&D centre of the BMW Group’s BMW China Services has talked about their R&D strategy which is based ‘in China’ and ‘for China’. He also mentioned setting up of customer-oriented and prospective R&D system in Beijing, Shanghai and Shenyang.